I've recently reread James Agee's Let Us Now Praise Famous Men (yes, the whole thing, cover to cover), which, naturally enough, has gotten me thinking about, well, James Agee. And to think about James Agee leads to thinking about his contribution to the history of film criticism. Which leads to thinking about the history of film criticism itself. Which is pretty much the way that topics for popular cultural semiotic analysis get generated. 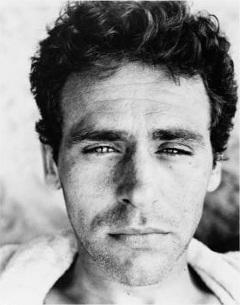 I am assuming that you know who James Agee was/is. Perhaps I shouldn't, for while Agee is wildly popular among his devotees, his fame doesn't go much beyond a rather passionate circle of friends. A mid-20th century poet, novelist, pioneer film critic, passionate muckraking journalist, screenwriter (he wrote the screenplay for The African Queen), and all-around man-about New York and Hollywood who seems to have known (or been known by) just about every famous mid-20th century writer I can think of, Agee burned out at 45 in 1955 from basically too many drinks, cigarettes, and late nights (over which I will here, consistent with the Hays Code, draw a discreet curtain). So that takes care of the introductions. Agee, as I've said, was something of a pioneer in film criticism. With no formal training in the art whatsoever, Agee wrote spellbinding reviews of popular movies, helping to pave the way for such later luminaries of the popular film review as Pauline Kael, David Denby, and Vincent Canby. These critics (and many more: don't hesitate to add your favorites in the Comments section) carved out a space for serious criticism of commercial films in the newspapers and magazines of America, addressing themselves to ordinary moviegoers rather than to an academic audience—and managed to make a living at it without academic appointments. To say that the space for such a profession is drastically shrinking (along with paying journalistic careers as well) in the era of the Internet blog and movie review sites like Rotten Tomatoes and IMDb.com—not to mention pop culture podcasts—is to say nothing that hasn't been said many times before: it is a favorite topic on personal movie review blogs whose cinephilic authors are long on movie knowledge, and very short on paying projects. What I want to do here is situate the phenomenon in a larger cultural system, or context, to see what it might tell us about the current state of American culture. When we do this, we can find a great number of intellectual pursuits today that require much learning and high-level writing ability, which are exploding with participants and imploding as viable ways to make a living. To go back to journalism, while there are more journalists today than there have ever been before, the vast majority must make do with pitifully compensated freelance work (no benefits, no job security, no job, actually) or nothing at all (did you know that The Huffington Post does not pay its contributors?). Now let's turn to academia—especially the literary profession. You probably do know what is happening there: what jobs exist are overwhelmingly in adjunct ranks (especially—and notoriously—in the teaching of writing). Indeed, the figure I keep seeing is that something like 70% of the university/college teaching in this country is performed by adjuncts. I don't think that I have to explain to you what this means in terms of job security and pay. (For an excellent blog article describing the trials and tribulations of an adjunct professor-turned-freelance- journalist, please read Nathaniel Oliver's "Where is the Grass Greener?" at The Chronicle of Higher Education). What is happening here is a massive transfer of wealth from what might be called, in general terms, the writing professions, over to the technological professions. This transfer is part of a much larger socio-economic phenomenon that has seen an ever-increasing concentration of the world's wealth into fewer and fewer hands. Even within what is left of the writing professions, such a division between the haves and the have-nots is occurring, with those relative few who can make a living—the last well compensated journalists, the last formally employed movie critics, the last tenured professors—often doing quite well, edging into the upper-middle class even as their less fortunate colleagues fall into poverty (note bene: I am not whining here; personally, I am doing fine). To put this another way, the kinds of middle-class professions that certainly attracted me in the 1970s and have attracted anyone who reads the Bits blogs, have, like most middle-class professions in America today, melted away in the face of a technological economy that offers a clear path to the upper-middle and upper class for those who choose it, while effectively hollowing out the middle. This shift in the economic infrastructure (if I may use classic Marxist terminology) is a major driver in the transformation of America from a (broadly speaking) middle-class to what might be called an all-or-none society, with an increasingly prosperous upper-middle and upper class, and an increasingly desperate everybody else. So whether or not the craft of film criticism is better or worse in the era of Rotten Tomatoes is not my point. My point is that the near disappearance of the profession of film criticism is a sign, a signifier of the place of the literate arts in America today. And given the fact that so many people are choosing to practice the literate arts today in spite of the economic consequences, it can also be taken as a sign of the continuing passion (and, I dare say, need) for writing in America—a passion and need to which our neoliberal society can only pay lip service, not a living wage. One wonders what Agee, passionate explorer of the plight of the agricultural working class that he was, would say about that. Do You Know Nancy Duarte? I’ve written about Duarte before, and in particular about her books Slide:ology: The Art and Science of Creating Great Presentations and Resonate: Present Visual Stories that Transform Audiences. 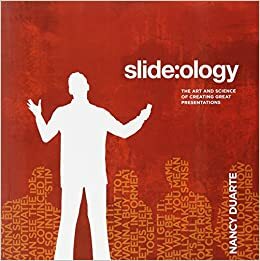 I came across Slide:ology when it was first published in 2008 and immediately introduced her ideas to the students in my second-year writing class, who were preparing presentations. Her advice about slides was contrary to the usual “no more than five bullet points per slide,” arguing that slides should be visually powerful and engaging on their own terms and that one word or one striking image can enhance a presentation much more than three bullet points. Since then I’ve watched a number of TED Talks that use Duarte’s principles and have seen students take them up to great effect. 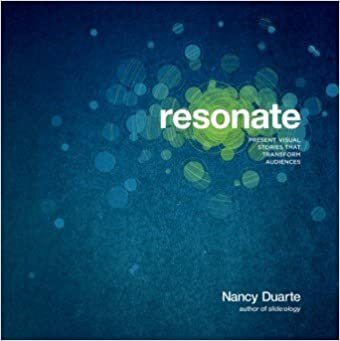 Then in Resonate I learned about the extensive research Duarte has done on the structure of effective presentations. She looked at hundreds of speeches—from Martin Luther King’s “I Have a Dream” to Steve Jobs’s iPhone launch speech—and found that they all shared a similar structure. Each moved from “what is” or the status quo to “what could or should be,” often moving back and forth between the two before building up to a peroration about what should be. I then started looking at speeches myself and found this same structure at work in many of them. So I’ve learned a lot from Duarte about how to help students make increasingly powerful presentations. Since Duarte uses slides so frequently, I was especially interested to read that she recommends that speakers NOT begin with slides. Rather, she prefers to use 3 x 5 cards or sticky notes and put one idea on each one, then put them all up on a wall and study them. In other words, she wants to have the arc of her argument—the story she is telling—very, very clear before she starts creating slides that will embody that story. More good advice. While I’ve read most of her books, I only recently discovered Duarte’s blog, which I am now reading regularly. The most recent one, dated August 21, 2015, is entitled “Tough Audience? 5 Ways to Stay Calm, Cool, and Collected.” In it she confesses to looking forward to the next season of Downton Abbey but says that she keeps herself occupied during the wait for it by watching the British Prime Minister’s Question Time in the House of Commons. So Duarte is doing more research, studying how the PM handles tough questions and “wrangles” members of the British Parliament. She gives us a good example of the kind of research a successful rhetor needs to do, and it’s the kind of research our students can also carry out. I can imagine students doing terrific analyses of how the PM handles audiences—or of doing the same thing for current Presidential candidates. Great food for thought in class. I am also now going to recommend Duarte’s blog to students so they can follow her as well. While she has not to my knowledge studied rhetoric formally, she knows a lot about it through practice!